Home » animal adoption , animals , dogs , kristen , pets » Name these two dogs! These two sweet little chihuahuas need help. Your help! They have a home. They have love. They just need names. My girlfriend brought them home this past weekend from an animal adoption agency. Right now their names are Lou and Blue. Lou is toward the top of the photo and Blue is in the bottom half. They are a mother-and-son pair and Kristen took both of them into her heart and home. And they are absolutely cute and sweet and loaded with personality. But Kristen is thinking that they need some real names. I mean, "Lou" and "Blue" are what they came up with at the agency, after these two were rescued from a really horrible situation. They each deserve a proper christening. So I'm putting it to this blog's readers: what would y'all suggest we name them? Remember, they're a mother-and-son pair, and Kristen would like that to be borne in mind. Name ideas don't have to be of fictional or nonfictional mothers and sons, but please nothing intimating errr... "improper" relationships! Blue is a good son and is very protective of his mommy. And if you are thinking about bringing a new pet into your life, I really can't ask enough that you consider getting one from an animal adoption outfit. These are dogs and cats that deserve a good loving home and will definitely show their appreciation for it (Lou and Blue already have to Kristen). For just a small fee you can start providing a good life for a pet which otherwise would never have one. 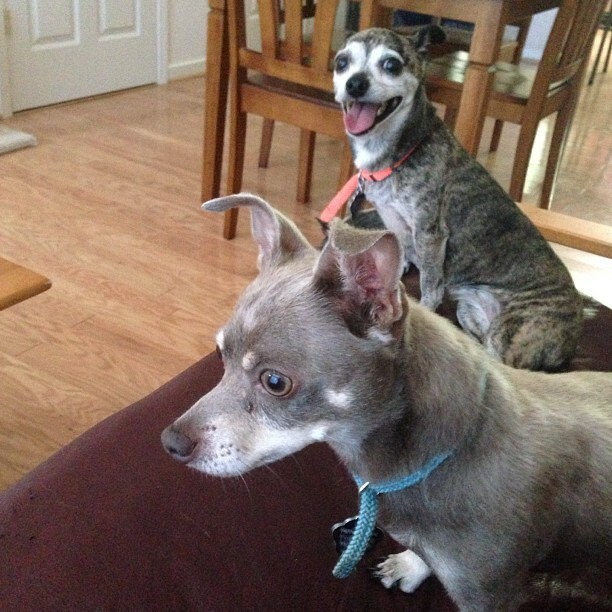 Lou and Blue came from Planned Pethood Clinic & Adoption Center in Rocky Mount, Virginia. But if you don't live in the area around Franklin County or Roanoke, there are many reputable agencies throughout the country which you can contact. So, you think you can help these little guys with some shiny new monickers? Let's hear 'em! get it? Brindle (her color) and GraySON, (her Gray son) Whatever names you choose, they are adorable.